Solar swimming pool heaters should really be called solar swimming pool climate control, as they do more than just heat your swimming pool! In the spring, fall and early weeks of summer, when swimming pool temperatures are quite cool, solar swimming pool heating uses the energy of the Sun to heat your swimming pool by pumping water out of your swimming pool, warming it up in solar coils by Heliocol, and then returning it to your pool at the perfect temperature. Plus, in hot summer weeks when the real problem is water that has become too warm for your swimming comfort, a solar heater becomes swimming pool climate control. At night, when it is cooler, water is pulled out of your swimming pool, cools off in the darkened coils, and then is put back in your swimming pool. Truly climate control to maintain the temperature of your swimming pool in all seasons! It is simple and it works. Solar rays produces the energy to heat a pool so you can enjoy swimming from Spring to Fall, earlier in the morning, and later in the evenings! Too many people pay for the upkeep of a swimming pool and get very little use out of it, simply because they are dissatisfied with the temperature. Solar pool heating allows you to take full advantage of a longer swim season and pleasant water temperatures! For additional information about how to have pool climate control with a Heliocol solar pool heating system, connect with Solaron in Woodland at 916-631-9293. 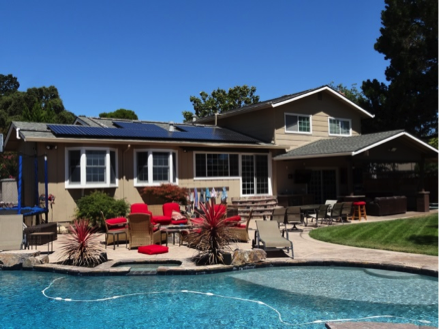 An expert from our solar team will come to your home, investigate the landscape and the pool and present a no-obligation estimate for a solar pool heater installation. Trust Solaron for advanced products in solar pool climate control! Solaron uses energy for life!